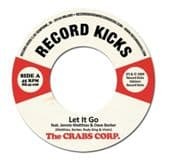 On this limited edition 45 that anticipates the album, youll find the irresistible r&b stomper "Back of my hand" and a deep funk monster "Coming from a higher place". You will remain impressed by soul sensation Dionne Charles vocals and the Baby Charles' sound. If you dig Sharon Jones & the Dap Kings, Quantic Soul Orchestra, Sweet Vandals, youll definitely love this. 100% deep funk & soul goodness for your delight. 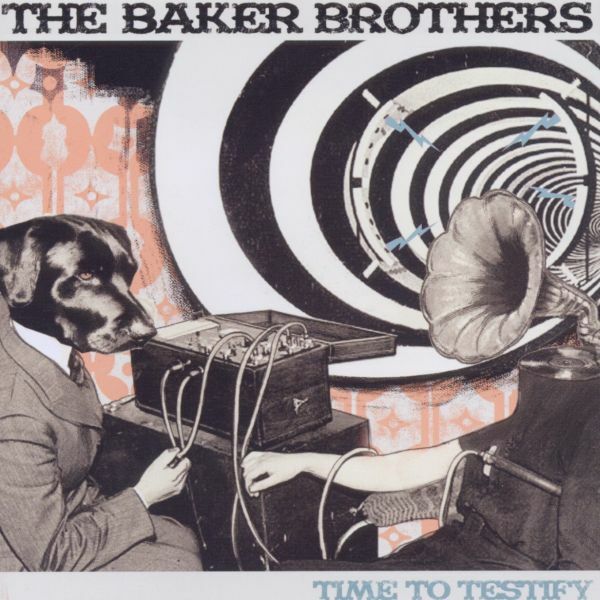 7th Studio album form Uk funk Titans The Baker Brothers. Modern soul, funk and dancefloor jazz. 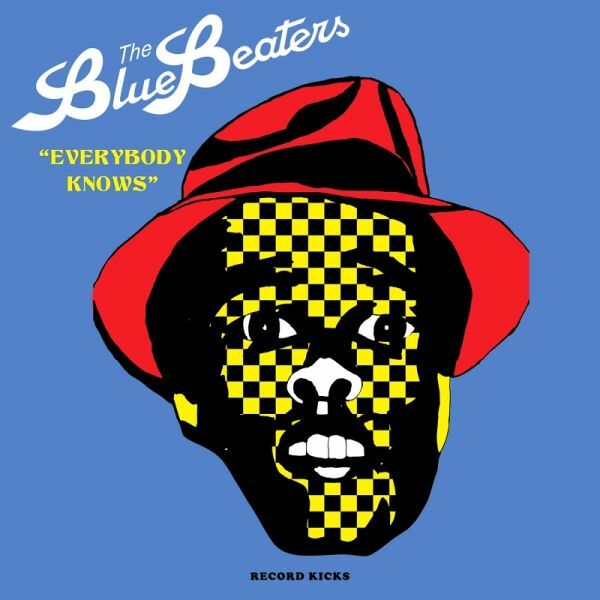 the return of one of the most exciting Blue Beat and Jamaican Ska band ever existed. After six years from their last gold record status "Combo" released on Universal Music, The Bluebeaters are finally back with a brand new album. "Everybody Knows" is the fifth studio album from the Italian Rock Steady & Ska giants and the magic formula remains unchanged. 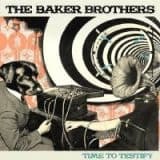 The BB takes a bunch of hits from the past and present and re-arrange the songs like if they were recorded in Kingston Jamaica in the 60s and early 70s. The classy musicianship of the combo, lead by original members and top musicians Mr T-bone (Derrick Morgan, New York Ska Jazz Ensemble, The Slackers) on trombone, Paolo "The Angelo" Parpaglione on sax, Count Ferdi on drums, Cato on guitar and Pat "Alton Ellis" Cosmo on vocals, makes them able to give to the songs a totally brand new life. All songs are cooked with BBs unique and super spicy Jamaican sauce. 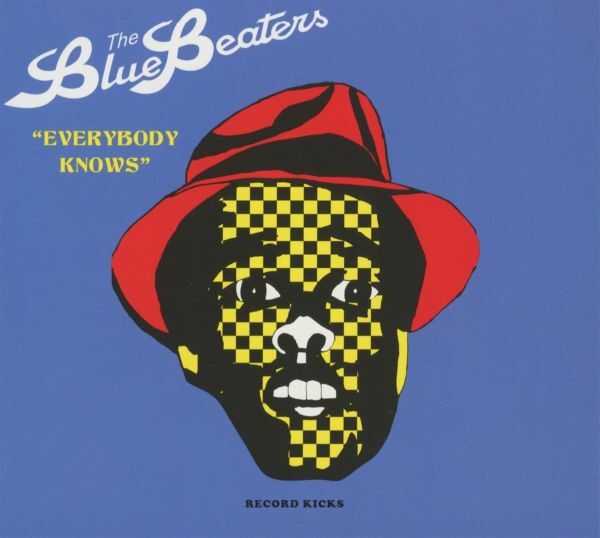 From Oasis "Roll with it", to seminal punk hit "Teenage kicks", Kraftwerks "The model" or Neal Youngs titletrack, were in safe hands, the Bluebeaters delivers 14 scorching old school ska and reggae tracks able to set every dancefloor on fire. After so many studio albums, soundtracks, TV programs and an incredible amount of concerts, "CLBR35 Live From S.P.A.C.E" is the very first live album by our cinematic funk champions. Recorded during two very special nights of the Italian leg of the S.P.A.C.E. Tour at BIKO club Milano and mixed by Calibro's head honcho and fresly grammy award winner, Tommaso Colliva at Toomi lab studio in London, it sees the Milan quartet joined on stage by Ottone Pesante horn session. Most of the tracks are taken from their latest heavily acclaimed studio album "S.P.A.C.E." but there's room for some Calibro 35's classics such as "Eurocrime", "Notte in Bovisa" and "La Mala Ordina" by Armando Trovajoli from their debut album of 2008. Italian cinematic funk heroes Calibro 35 release their studio album "DECADE" and celebrate 10 years. "DECADE" marks 10 years of Calibro 35s releases and its the very first album recorded by Calibro with an orchestral-inspired enlarged line-up that features horns, strings and percussions. Mixed and recorded by CALIBROs usual suspect and Grammy Award winner Tommaso Colliva, on the album all the influences collected by the band during their last ten years journey like music, collaborations, movies, gigs, books find their space. "DECADE" is CALIBRO 35s "time capsule" and is as rare and complex as a timeless work. 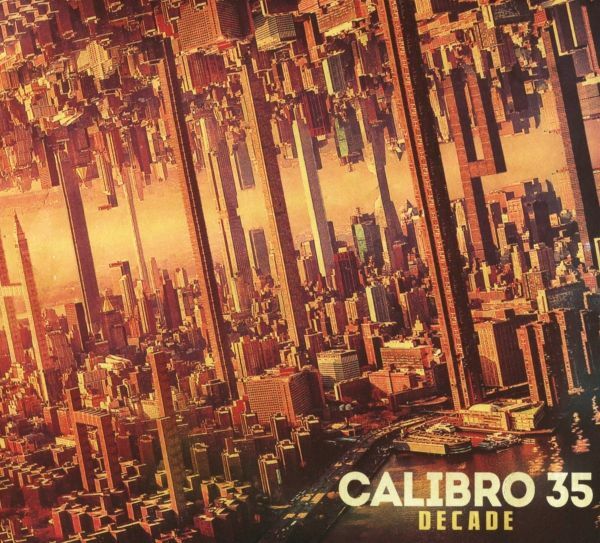 Italian cinematic funk heroes Calibro 35 release their studio album "DECADE" and celebrate 10 years. "DECADE" marks 10 years of Calibro 35s releases and its the very first album recorded by Calibro with an orchestral-inspired enlarged line-up that features horns, strings and percussions. Mixed and recorded by CALIBROs usual suspect and Grammy Award winner Tommaso Colliva, on the album all the influences collected by the band during their last ten years journey like music, collaborations, movies, gigs, books find their space. "DECADE" is CALIBRO 35s "time capsule" and is as rare and complex as a timeless work.comes in beautiful gatefold cover. ltd edition 45 vinyl featuring Calibro 35's new single Psycheground taken from the heavilly acclaimed new album DECADE. Psycheground is an afro funk stormer and sounds like Tony Allen involved in writing a score for a vintage Hollywood production. On the B-side an alternative afro/tropical version of Polymery. Recorded on tape on a 8 tracks tape recorder at the analog Mecca Toe Rag Studios in London, the worldwide famous studio where The White Stripes penned "Elephant", S.P.A.C.E. 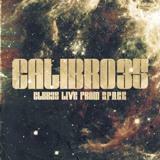 is the 5th studio album by Calibro 35. Forget about gripping noir atmospheres of their previous full lengths, with the new album the Milan Combo escapes from planet earth and lands on their own satellite to write the perfect funk soundtrack of an imaginary SciFi movie directed by Sergio Leone. In S.P.A.C.E. Calibro 35 sounds as explosive, cinematic and groovy as ever.... get ready and be prepared to wear spacesuits.Described by Rolling Stone Magazine's as "the most fascinating, retro-maniac and genuine thing, that happened to Italy in the last years", Calibro 35 enjoys a worldwide reputation as one of the coolest independent band around. 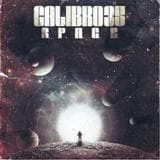 Music by Calibro 35 has been used on Dr.Dre's hip hop album of the year "Compton" ("One Shot One Kill feat Snoop Dog"), Jay-Z ("Picasso Baby"), Child of Lov & Damon Albarn ("One Day"). They've played major venues and festivals all over Europe, with several trips in the States and they've collaborated with PJ Harvey, Mike Patton, John Parish and Stewart Copeland. Gatefold sleeve... Recorded on tape on a 8 tracks tape recorder at the analog Mecca Toe Rag Studios in London, the worldwide famous studio where The White Stripes penned "Elephant", S.P.A.C.E. 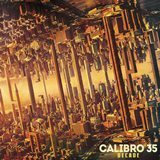 is the 5th studio album by Calibro 35. Forget about gripping noir atmospheres of their previous full lengths, with the new album the Milan Combo escapes from planet earth and lands on their own satellite to write the perfect funk soundtrack of an imaginary SciFi movie directed by Sergio Leone. In S.P.A.C.E. Calibro 35 sounds as explosive, cinematic and groovy as ever.... get ready and be prepared to wear spacesuits.Described by Rolling Stone Magazine's as "the most fascinating, retro-maniac and genuine thing, that happened to Italy in the last years", Calibro 35 enjoys a worldwide reputation as one of the coolest independent band around. 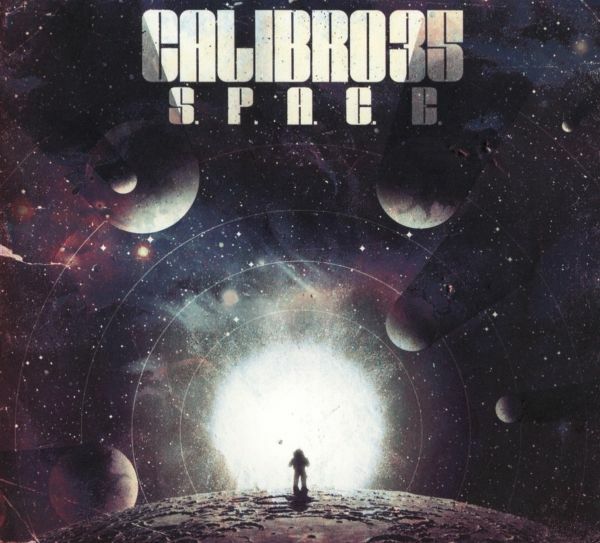 Music by Calibro 35 has been used on Dr.Dre's hip hop album of the year "Compton" ("One Shot One Kill feat Snoop Dog"), Jay-Z ("Picasso Baby"), Child of Lov & Damon Albarn ("One Day"). They've played major venues and festivals all over Europe, with several trips in the States and they've collaborated with PJ Harvey, Mike Patton, John Parish and Stewart Copeland. "Italian soundtrack funk that sounds like Goblin recording at Stax!" 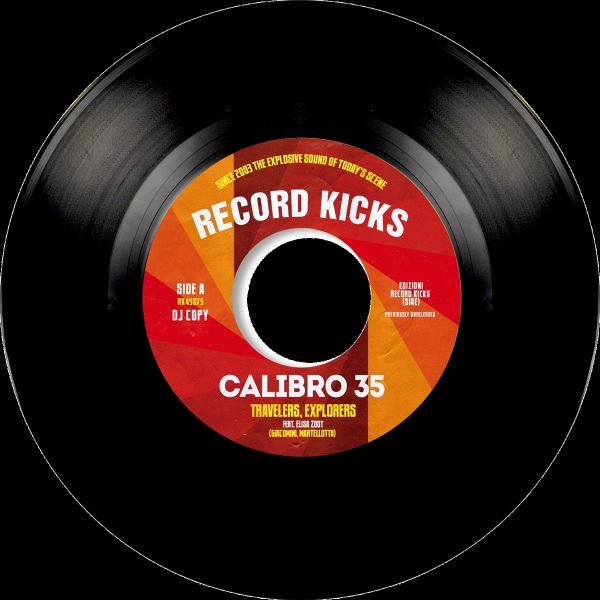 Wax Poetics Magazine Record Kicks proudly presents the new album by Italian Soundtrack Funkateers Calibro 35! There's one thing that Italians do better than others, funky soundtracks. Quentin Tarantino knows best: soundtracks from Italian movies of the '60s and the '70s are the THING! "Calibro 35 does with music what Tarantino does with films". They borrow what they love and they make it their own. With Rolling Stone magazine words "Calibro 35 are the most fascinating, "retro-maniac" and genuine thing, that happened to Italy in the last years", think at The Budos Band that meets Morricone. 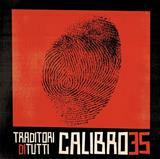 the reissue of Calibro 35's masterpiece "Traditori Di Tutti" on a limited Gatefold LP edition. Originally released in 2013, the long time sold out vinyl finally gets a re-release in a Gatefold LP format with digital download code. Italian cult combo Calibro 35 announce the release of the new single "Travelers, Explorers feat Elisa Zoot", an unreleased vocal version of the closing track of the latest album DECADE "Travelers". Limited to 500 copies. Ltd trasp ed. 250 copies. 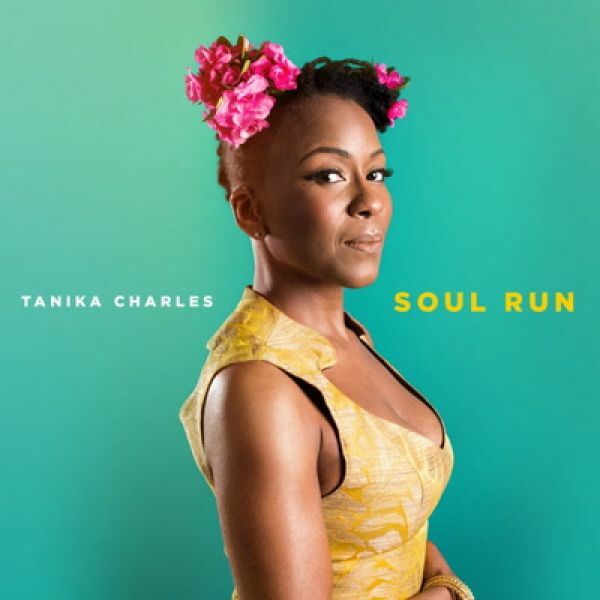 "The most buzzed-about Soul singer in Toronto (CBC Music)" TANIKA CHARLES. The 1st single "Soul Run" produced amongst the others by Slakah The Beatchild (BBE Records / Drake) anticipates the self-titled debut album that will hit the streets worldwide on April the 7th on Record Kicks. Available on this limited to 500 copies worldwide 45 vinyl, Soul Run is a floorshaking Soul bomb that will set every dancefloors on fire. On the flipside the stunning x-over Soul tune "Endless Chain". First single taken from the new album "The Gumption". In a few short years, Tanika Charles has transformed from an emerging solo artist to a commanding performer and bandleader, a staple in the Canadian soul scene, both on stage and off. Edmonton raised Charles presents an immutable charm, at times endearingly abrasive and honest in her vulnerabilities. If Tanikas singing it, shes lived it! 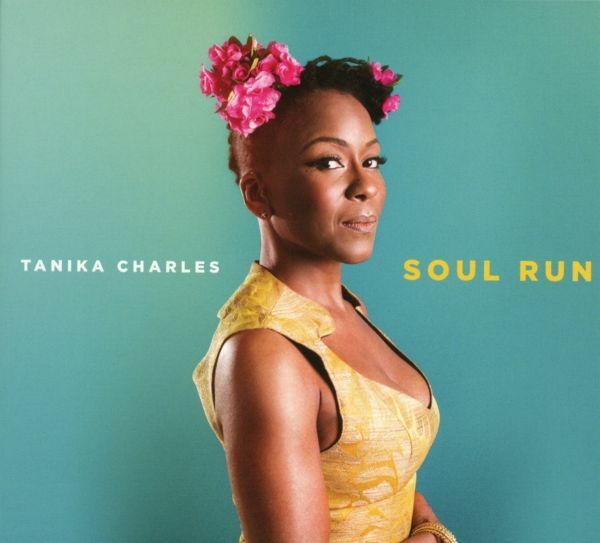 "The most buzzed-about Soul singer in Toronto (CBC Music) "Tanika Charles. Her debut album "Soul Run", produced among others by Slakah The Beatchild - best known for his works with Canadian rapper Drake. Produced by a stable of some of Canadas finest musical minds including DJ Kemo (The Rascalz, Kardinal Offishall), Chin Injeti (DJ Khalil, Eminem, Drake) and Daniel Lee (Hooded Fang, Phedre), Record Kicks proudly presents "The Gumption" the awaited new album by Canadian soul star Tanika Charles. Predominately guitar-driven mid-tempo soul, with a handful of dance floor friendly tunes and some psychedelic leanings, The Gumption was indirectly influenced by the likes of Alabama Shakes, The Supremes, Khruangbin, DAngelo, and Moses Sumney. It is sonically moody at times, but with consistent silver-liningarcs. "Ive grown up and learned to deal with situations significantly better. We have a tendency to hold back our innermost feelings for fear of hurting others. Even when were happy we worry about over-sharing, as if joy is a competition you dont want to gloat about." 2 incredibly hard to find and super hot deep funk & x-over soul pearls out of Macon, Georgia on a super limited edition 45. 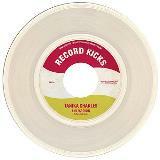 2 explosive early reggae new cuts feat Jennie "Belle Stars" Matthias and Dave "double barrel" Baker. 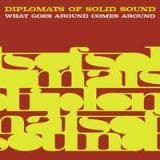 Second single from Diplomats of Solid Sound feat Diplomettes album... and the magic couple DoSS / Lack Of Afro is back. After producing Diplometes of Solid Sound feat Diplomettes full lenght, Lack of Afro aka Adam Gibbons has picked up and reworked another track from from US ambassadors of funk & soul's album. As usual expect a heavy dose of breaks, percussions, deep funk and dancefloor grooves from Adam. "If you're wrong (Lack of Afro rmx)" is 100% boogie-funk action. 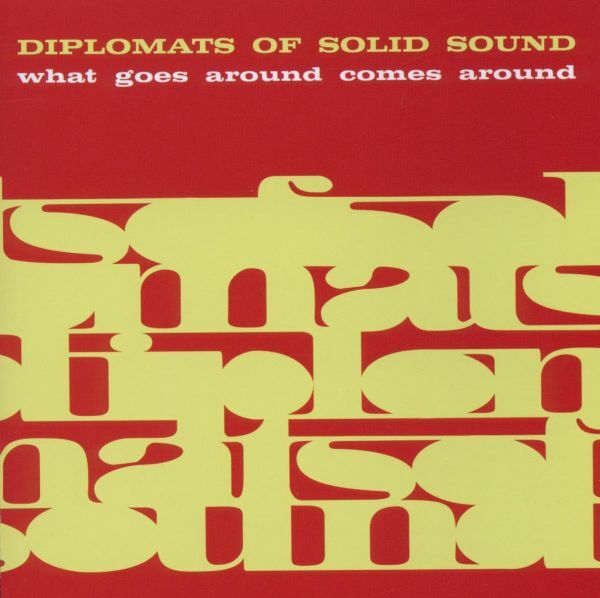 "Hurt me so (LOA rmx)" the first Diplomats of Solid Sound track remixed by MR.Gibbons is still a massive spin on all funk dancefloors around the globe.. we're pretty much sure that this will be another winner. On the flip side the groovy soul original version. Ambassadors of instrumental soul DIPLOMATS OF SOLID SOUND featuring for the first time "three gifted soul sirens" The Diplomettes. The 45 anticipate the new album produced by Freestyle Recordss new kid on the block Adam Gibbons aka Lack Of Afro, to be released on Record Kicks next 14 April. Expect a ton of funk & soul shakers. Here on the A side the deep funk mover Plenty Nasty and on the B side Lack of Afro reworked the solar Hurt me so in to a funky big beat, Jamaican flavoured floorfiller. Already a Jelly Jazz Club classic.